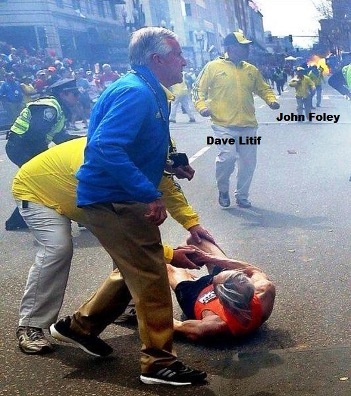 IAM Local 264 members Dave Litif, John Foley and Mike Rowan (not pictured) quickly went from being Boston Marathon volunteers to first responders after a pair of bombs killed three and injured dozens near the finish line on April 15, 2013. Three members of IAM Local 264 in Boston, MA were honored recently for their bravery and quick thinking in the immediate aftermath of the April 15 bombings at the Boston Marathon. Within seconds of the explosions, IAM members John Foley, Dave Litif and Mike Rowan, who were working as finish line volunteers, moved to tear down barricades around the blast site and immediately began treating the wounded. The three Machinists were recognized with special medals made by fellow Local 264 member Chris Fernald to commemorate their actions.